BOSTON - Six different players scored goals as the No. 3 Northeastern women's hockey team clinched a share of the Hockey East regular season crown and the No. 1 overall seed in the league playoffs following a 6-3 victory over Merrimack on Friday at Matthews Arena. The Huskies (21-3-4, 19-2-2 WHEA) now need one more point (or a BC loss/tie) to clinch the outright regular season title for the second time in program history and first since 2012. With Friday's win, NU also matched its highest point total (40) in league play since joining Hockey East in 2002; the 2015-16 team also notched 40 points with a 20-4-0 WHEA record. Northeastern scored two goals in each period on Friday to extend its home winning streak to 12 straight games. Junior Andrea Renner and senior Tori Sullivan scored in the opening period to give the Huskies a 2-0 lead after one, before senior Kasidy Anderson and freshman Miceala Sindoris added second-period goals to extend the lead to 4-0. For Anderson, the goal represented her 50th collegiate tally, making her the 22nd player in program history to reach the mark, while Sindoris notched her first goal in a Northeastern uniform. Both teams scored twice in the final frame to round out the scoring. Sophomore Veronika Pettey scored her NCAA-leading seventh power-play goal of the season early in the period, and freshman Alina Mueller capped a three-point effort with an empty-netter at 19:49 to stave off a late Merrimack (14-10-5, 10-9-3 WHEA) rally. 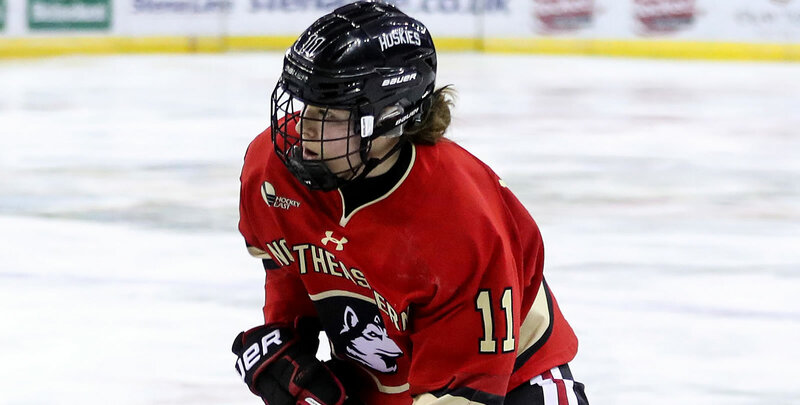 Mueller was one of five Huskies to register multi-point efforts, joining Anderson (goal, assist), Sullivan (goal, assist), and sophomores Skylar Fontaine (two assists) and Brooke Hobson (two assists). Sophomore Aerin Frankel stopped 28 of 30 Merrimack shots to move to 16-1-2 on the season and 15-0-0 in WHEA play. Northeastern's No. 1 ranked penalty kill negated all five Merrimack power-plays on the night. The Huskies will look to capture the Beanpot consolation game on Tuesday, Feb. 12 against Boston College at 5 p.m.